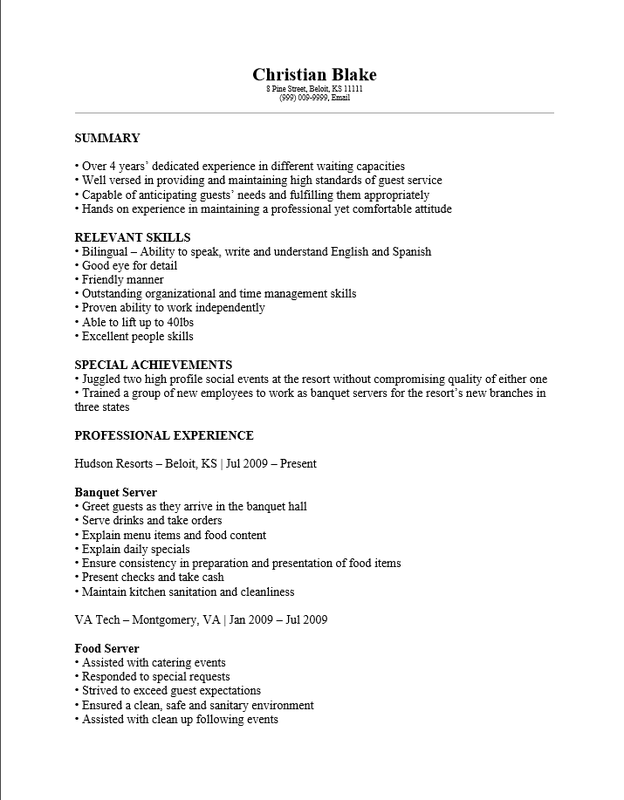 The Banquet Server Resume Template gives a useful option for developing a server resume in the banquet industry. 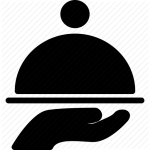 The banquet industry has some very busy times of the year and if one is not attached to a specific organization or catering company they will likely find themselves having to send out their resume fairly regularly. This is the key method for a candidate to answer a job posting and introduce him or herself to a potential employer. It is therefore often considered vital to mention the employer’s name in both a resume and cover letter and absolutely crucial this document looks and sounds as professional as possible. This is an industry where things must look picture perfect so recruiters will scrutinize a resume to make sure they get the best of the best. A fine way to send out many resumes in a short amount of time is by use of a template. Templates are often used whenever a document will require revisions to be done relatively quickly. 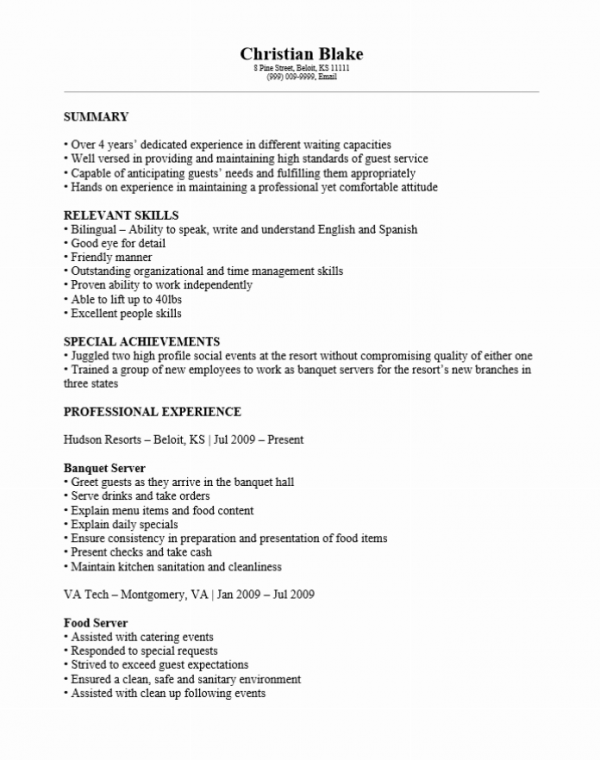 Since this is a formatted document all a candidate need do is simply fill out the sections. If this is done with some care he or she will have a master document which may be pasted into a blank template and quickly revised while keeping the original. By maintaining an original the job seeker will always know precisely what needs to be changed to cater to the potential employer’s needs. This level of organization will prove useful in most job searches. Step 1. The top of the page should contain the applicant’s contact information. It should be aligned according to the headings of the document. Step 2. The first section will be a summary of the job seeker’s experience and knowledge in a bullet format. Relate this to the job you are applying to and title it as such. Step 3. The Relevant Skills section is a list meant to introduce an employer to a candidate inquiring about a position. This list should directly relate to the job requirements. Step 4. The next section is the “Special Achievements” section. If you have gained any notoriety in this field or accomplished anything especially impressive, list this here. Step 5. The Professional Experience section is your employment history. List this in reverse chronological order according to the dates you worked in a company. Step 6. The Education section should be a list of your schools and graduation dates. Also list the title of your degrees and any relevant information.